I think this is the first cake that I make using my “Free Choice” pass with the Heavenly Cake baker group. While most of my fellow bakers are at the 70+ cake mark, I believe, I have only done about thirty-seven of them (hard to keep track), so as you can see I need to SERIOUSLY play catch up. And our organizer, Marie has giving us a free choice each month to do just that. While some of my fellow bakers have taking this and baked not, one, but two cakes during their free choice, I have totally and completely taken the high road to slothfulness and even sat there to deliberate which cake to do, and eventually gave up on myself and just not do a thing. *hanging head in shame*. But this weekend, I was NOT GOING TO let my LAZY side win. I was going to do a cake, come hell or high water. I just needed to choose an easy one. And I remember the Chocolate Streusel Coffee Cake that was done back in January and I had my eye on it for a bit, because everyone just raved about it. 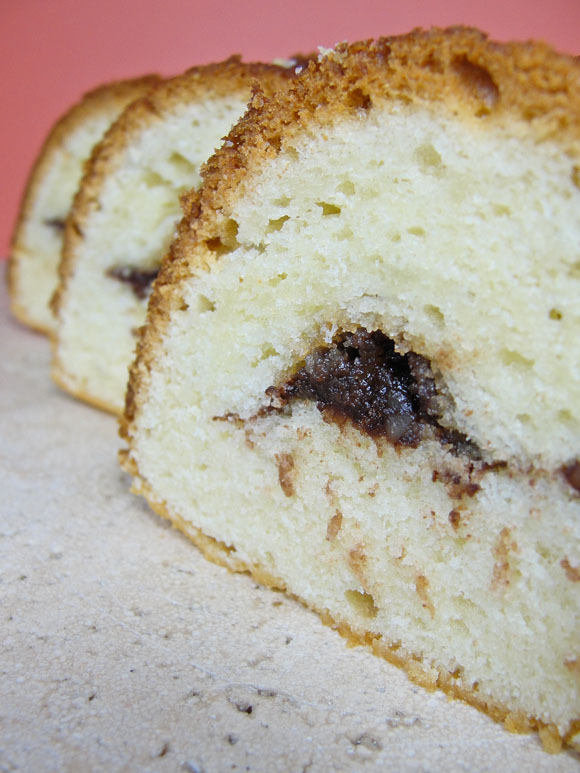 Plus after the light, airy Financier Style Pound cakes of last week, I was craving a honest to goodness heavy cake. I was right, it came together pretty fast. I did change up the “streusel” part. The recipe called for Muscovado sugar, cocoa and cinnamon. I replace the Muscovado sugar (ran out) for brown sugar, omitted the cinnamon (never like the cinnamon/chocolate combo) and added chopped walnuts (because they were right there and why not?). The other thing that had me going “oh, oh” was the fact that this is one of those cakes in the book that makes you do cupcakes on the side with the extra batter. I totally ignore this step, because a) was feeling rebel-like and b) my ten-cup Bundt baking pan was a deep pan that could take the extra batter in the first place. After 30 minutes in the oven, out it came and with a ten minute resting period, it fell out of my pan with no issues once I turned it over. I know that I always mention my old, old Bundt cake pan and how I envy the other baker’s fancy cake pan. But, this pan has never ever let me down when it comes to unmold its contents. Maybe I should not give it such a bad wrap. Tom: “I will have it finished it by tonight; this one is a good one”. I had to agree, this cake perfectly took care of my “heavy-pound cake” craving. I also love the middle streusel of chocolate and the walnuts gave it an extra crunch. The only thing is that next time I’m going to pour it in a better pattern so have more across the cake piece, instead of just the middle.